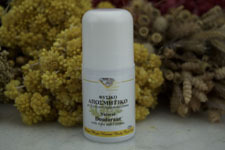 Our deodorant is all natural and using the finest organic ingredients you'll not find any aluminum products, here. Using Propolis to combat bacteria you'll find odor is gone and the lotion base rich in Aloe is gentle on your underarm. Allowing your underarm to breathe, though dealing with that which creates odor! For now we offer just this one, but check back we have plans for a few more.